Seasons Greetings from Jeff Lange! Celebrate the holidays with this new DVD featuring the 2018 Mickey’s Very Merry Christmas Party at Walt Disney World. Your Very Merry Christmas Party begins as you receive a Party wristband, which allows for a whole evening of fun in the Magic Kingdom! The main entrance looks festive with holiday decor. You stop for a Party guide map before picking up your Enchanted Tiki Room Sorcerers of the Magic Kingdom souvenir card. Next, the Main Street bypass beckons again this year with some fun holiday photo opportunities and a first Christmas cookie! You check out some Party merchandise before heading out to meet characters. Your first character stop is to meet Jack Skellington as Sandy Claws – and for the first time at Christmas, Sally! They are located in Town Square Theater. Next, you visit the Seven Dwarfs, Scrooge McDuck with Donald Duck, Daisy with Minnie and even Santa Goofy in Storybook Circus. The Pooh characters wear holiday scarves in Fantasyland, and Mickey is in Town Square Theater. You also pay a visit to Aladdin, Genie, Jasmine and Abu. “There’s no place like home for the holidays” – or the Magic Kingdom! You enjoy a Town Square parade view with the Christmas tree as a backdrop. 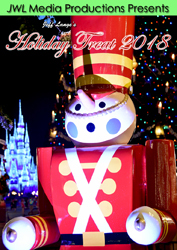 Characters including Mickey and Minnie, Anna, Elsa & Olaf, Cinderella and many others join perennial favorite toy soldiers, the prancing reindeer and Santa Claus himself for this festive procession! Wreck-it Ralph and Vanellope are also back this year. This fireworks spectacular lights up the sky over the Magic Kingdom and Cinderella Castle. The show is a combination of six “acts”: The Spirit of the Season, The Spirit of Holiday Wonder, The Spirit of Sharing Hearth and Family, The Spirit of Holiday Childhood Fantasies, The Holiday Spirit in Each of Us, and Christmas All Around Us. Experience all of its splendor including the amazing 180 degree fireworks finale! Mickey, Minnie, Goofy and Pluto join Daisy Duck on the Cinderella Castle stage in the third year of “Mickey’s Most Merriest Celebration” show as they try to figure out where Donald is – he isn’t tech savvy! Once Donald appears, the fun begins. Disney friends begin arriving, including Clarabelle Cow, Woody and Jessie, Chip and Dale, and Mickey and Minnie in special costumes! There is bell ringing, fantastic projections on Cinderella Castle and much more in this spectacular show that can’t be missed. Watch until the end as the Christmas lights on Cinderella Castle illuminate during the finale! You make your our way through the Magic Kingdom and stop for reindeer and polar bears dancing at Club Tinsel. You enjoy projections around the park and take an extended look at the holiday treats – including a number of different cookies, hot chocolate, soda, a snowman pretzel and more! And then you take a stroll down Main Street, enjoying a last look at the holiday decor, tree and Cinderella Castle as your Mickey’s Very Merry Christmas Party ends. Pick up a copy of “Jeff Lange’s Holiday Treat 2018” today and relive all the magic or experience it for the first time.